HubSpot CRM training teaches your sales process four brand new tricks that will send your team's capabilities into overdrive. Ever try to close a deal and spend more time on the documentation and mindless tasks than the actual sales? Say goodbye to any and all grunt work forever with the most powerful data enrichment functionality ever created. Just enter a prospect's email, and let HubSpot CRM take over, powering your sales process in the background while you keep moving. New leads can even be added directly from your inbox with one click. You focus on writing the email and let HubSpot CRM handle the research. Once installed, log a new contact with one click and instantly know when and where they open an important email, company info, key mutual contacts, and similar companies, all in one remarkably powerful 360-degree view. With a 10-second installation process, you'll notice the lightning speed of HubSpot CRM from the get-go. And it only gets better as you discover feature after feature that allows you to crank through a backlog of leads faster and more effectively than you can possibly imagine. No more expensive, difficult, and clunky CRM's that never get used. Act now to get completely free of charge with the most lightweight and powerful CRM that you've ever seen. A great way to build up user adoption for long term success. If you're on the fence, how's that for a kicker? Still imprisoned by "the way it's always been?" Still convinced that CRMs are too complicate, too expensive, and too outdated? Not all customer relationship management systems are built equally. 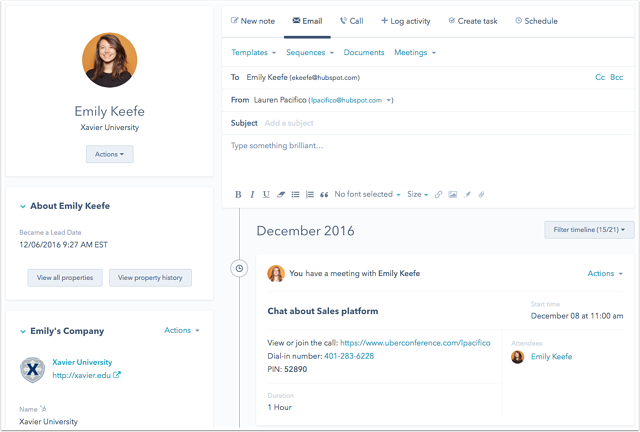 The free HubSpot CRM makes it easy for sales professionals to maintain relationships with prospects while managing their funnel. Your prospects and customers are too important to store in spreadsheets, inboxes, and memory. Don't let people fall through the cracks - keep them in one shareable, searchable database. Get a tool that adapts to your process, won't slow down sales and doesn't need IT. HubSpot's Free CRM is easy to learn and a breeze to customize, so you can focus on selling instead of learning a tool. Say goodbye to the tedious logging and manual data entry. HubSpot CRM automates the tasks you hate and connects with the tools you already use, so staying organized is effortless. See your entire pipeline at a glance and know where every relationship is at. HubSpot CRM tracks customer interactions automatically – whether they’re on your website, in an email, across social media or on a call. The CRM always works in the background with the tools you already use. Emailing a new contact? No problem, let us create that contact for you and provide enriched information about their company. Why spend hours manually searching for and entering information about your prospects? HubSpot CRM crawls the Internet and provides you with a database of 19 million companies (and growing). The HubSpot Sales plugin for Outlook has an additional component called HubSpot Sales for Windows that will allow you to receive instant notifications without the HubSpot Chrome extension. With HubSpot Sales for Windows, you don't need to run Google Chrome. Check the "Track Email" option from your Outlook menu. With Task Queues in HubSpot CRM, your sales reps won’t need to open dozens of tabs at the beginning of their day; they won’t need to sort through pages of to-do’s at a time; they won’t need to scroll a million ways to get to the next thing. Walk into work. Build your Task Queue. Press play. Run through your tasks. Go home. Rinse, wash, repeat. 80% of sales require 5 follow-up phone calls after the meeting, yet 44% of salespeople give up after one follow-up. Don’t let your clients be a part of the 44%. As a best practice, every deal in your database (and theirs) should have a next step. Task management in HubSpot has a brand new look, and a slew of new functionality to boot. Staying on top of to-dos is pivotal to your sales team’s success. Every missed follow-up is a lost chance at a connection with your prospects and customers. The Pro edition contains the features of free and adds powerful tools to supercharge every stage of your inbound sales process. Use the free version with the basics you need to adopt an effective, efficient inbound sales process then move the full-time sales professionals up to the Pro edition. Roles typically using the Pro edition are Business Development Rep, Inside sales rep, Account executive, Account manager or Renewal management. Transform your sales process with the all-in-one tool set that helps you sell in a modern way. HubSpot Sales works seamlessly between your CRM and Inbox to surface interested new prospects and useful details that help you sell in a relevant, personal way. HubSpot Sales Pro tools help you connect with the right people, at the right time, and with the right message. Tools like sales automation, meeting scheduling, and prospecting help power up your sales process, giving you more time to focus on selling. Notifications will bring you to your email tracking activity stream. This may be Microsoft Outlook 365 or Google Gmail. Templates contains all of the email templates created by you and your team. Go here to create new templates, or view performance metrics. These templates can be used when crafting emails to contacts either in the CRM or in your email client. Sequences are used to follow up with a prospect over time and makes it easy to tee up a timed series of emails based off your template that gets sent exactly when you want. Sequences brings you to a dashboard listing all of the Sequences created by you or your team. Come here to craft a new Sequence, or edit one that already exists. Enrolling a contact in a Sequence will take place on a contact records in the CRM or in your email client. Documents shows a listing of all the documents added by you or your team, as well as document performance. You can add new documents here, or share one that already exists. Once again, documents can also be added when crafting an email in the CRM or in your email client. Prospects helps you identify contacts visiting your web site and gives you insight in how engaged they are. You'll see individuals for a company and what pages they are viewing. Prospects contain 3 elements: a website visit activity stream, HubSpot's Company Insights database and a News/Events stream. Messages allows you to engage with web site prospects in real time through live chat. As prospects engage with your sales team every discussion is logged automatically to the prospect's timeline. Meetings is a personalized booking system that will present you with a dashboard of all the default Meeting links, as well as any others that you may have created. Go here to create new Meetings links or modify Meetings settings. Meetings links can be copied directly from this page, or added into you email templates. Call Queue contains a list of contacts that you have added to the call queue. From this page, you can add more contacts to the queue, or start calling. Contacts can be added to the Call Queue from their contact record as well. Below this, you will find more information about the record you are viewing such as an associated company or deal, Predictive Lead Score, list member and attachments. Email: Compose and send emails to contacts. You can send a Template, enroll the contact in a Sequence, attach a Document and add a Meetings link. Call: Place a call to the contact, or add them to your call queue. You have the option to record calls, which then get added to the contact's timeline. Log activity: Add details about a call, email or meeting that may have happened offline. Create Task: Create a task with a due date related to the contact. You will be reminded when the task is due via email. Schedule: Create a calendar event that can be shared with the contact. The bottom-right side of the contact record contains the contact's timeline. This includes any interactions taken on the contact. You can filter this timeline using the drop down labeled Filter timeline. By default, you are shown notes, calls, sales emails, tasks, meetings and email tracking activity. Email Scheduling (Send Later) - schedule your messages from Gmail to send at exactly the right day and time. Email Open Notifications - get instant notifications when your emails are opened, shown as an Activity stream. Email Click Notifications - get instant notifications when your links inside your email body is clicked. Email Tracking History - See a stream of recent email opens and clicks. Email Templates - Build a shared library of email templates. Collect useful metrics on which approaches work best. Free edition includes up to 5 templates. Documents - Build a shared library of sales content and documents. Get notified when your prospects engage. Calling - Place calls from your browser. Every call is automatically logged and recorded. Sequences - Tee up a series of targeted, personal emails to send to your prospects over time. Prospects - Uncover hidden sources of interested companies who are visiting your website. Meetings - Share your availability and let your prospects book your calendar without the back and forth waste of time. Reports - create custom reports, dashboards, report templates, and reports sent automatically by email. The HubSpot Sales extension adds Sales Pro features to your email client, outside of the CRM. This extension can be added to Chrome, for use with Gmail or it can also be added to Outlook for desktop. Learn how to install the extension here. 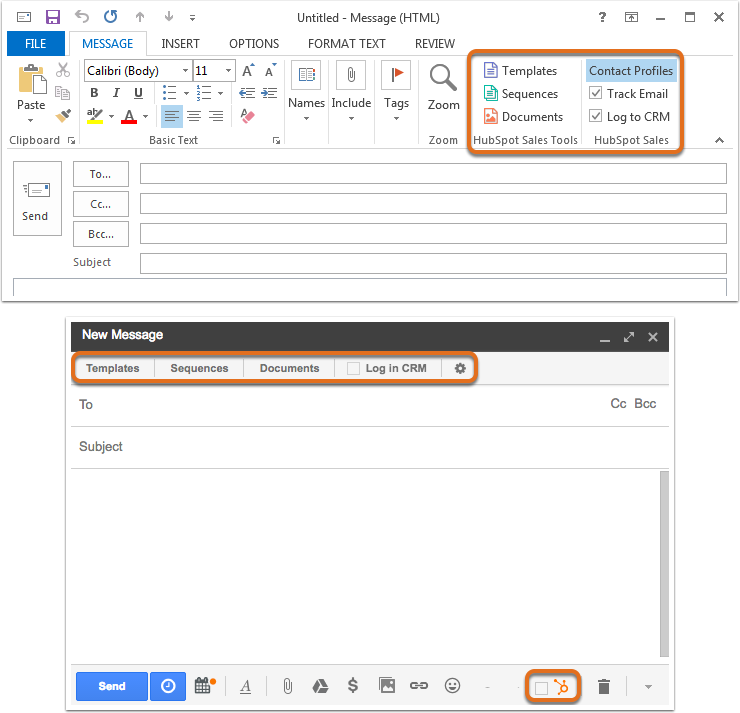 In the email compose window, you will have access to Templates, Sequences and Documents. 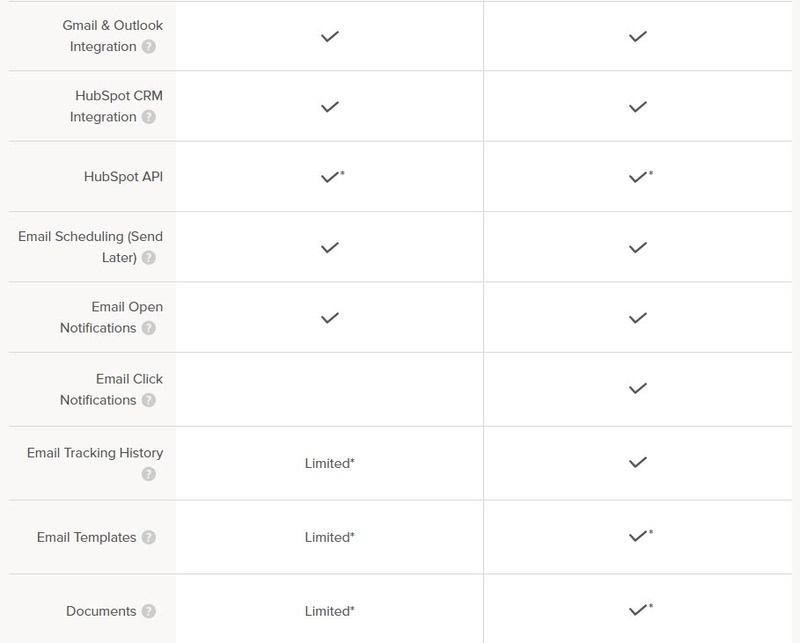 You can also enable email tracking, as well as log the email in your CRM. 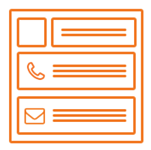 HubSpot offers a full stack of products for marketing, sales, and customer relationship management powerful alone, and even better when used together. Brian Halligan, co-founder and CEO of HubSpot and his team walks through HubSpot's tools in entirety. First, you'll see how our HubSpot Marketing can help you attract interested prospects, convert them into leads and nurture them with useful content. Then we'll take a look at how HubSpot Sales helps your sales team in a modern, efficient and inbound way. 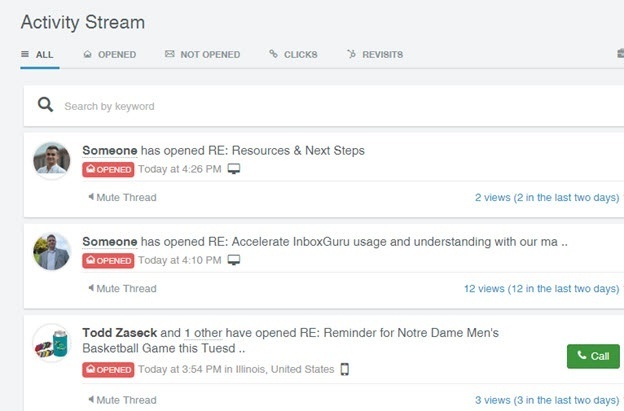 Finally, we'll see how HubSpot's CRM keeps everything organized in one place. PandaDoc is sales enablement software that automates contracts, proposals, and quotes. PandaDoc helps CRM users close deals, completing the final step in an inbound customer journey.